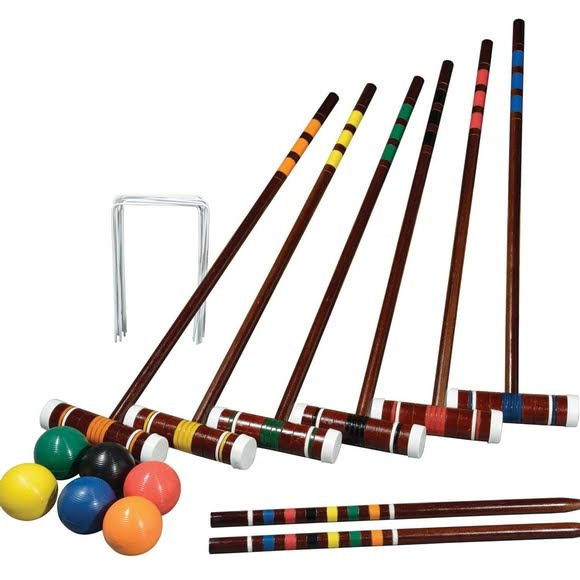 Franklin's Intermediate Croquet Set includes everything you need to assemble a unique course in your backyard and enjoy hours of family fun. The intermediate set is packed with four durable all-weather molded balls, four wood mallet handles and heads lacquered with a chestnut finish, two painted wood stakes and nine all-weather coated wickets. Franklin&apos;s Intermediate Croquet Set includes everything you need to assemble a unique course in your backyard and enjoy hours of family fun. The intermediate set is packed with four durable all-weather molded balls, four wood mallet handles and heads lacquered with a chestnut finish, two painted wood stakes and nine all-weather coated wickets. The object of croquet is simple; create a double-diamond pattern of wickets throughout your backyard or playing field with the wood stakes on each side. Navigate your way through the course and hit stake on each side to claim victory - play individually or in teams of two or three.